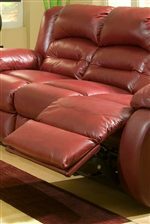 Rest easy with the comforting scene of the upholstered reclining wall recliner. Available in a wide range of fabric and leather upholstery, a contemporary design features a plush seat cushion, attached pub back and pillow top arms. 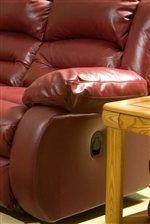 Put your feet up with the comfortable footrest with exterior handle. 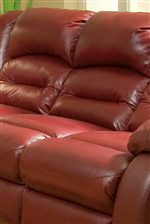 Also available as a reclining rocker (not shown), swivel gliding rocker (not shown) and as a swivel rocking recliner (not shown). Add the matching sofa and loveseat for a complete collection. The Austin Casual Upholstered Wall Recliner by Klaussner at AHFA in the area. Product availability may vary. Contact us for the most current availability on this product.